Includes: * Nite Lite® Tracker™ LED *Battery. 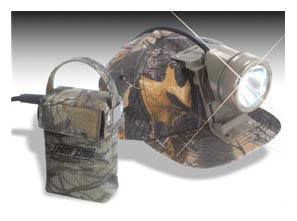 The Tracker is a light system for every hunter and outdoorsman. A versatile three-lights-in-one system: hands free headlamp, handheld lantern and belt worn walking light. The Tracker is the hunter's perfect companion...ideal for tracking wounded game, locating your tree stand or duck blind in those dark pre-dawn hours. Headlamp & charger-1 full year. Tracker Battery also available separately.